APPLICABLE: For many different kinds of materials and seam specifications. ♦ Max. 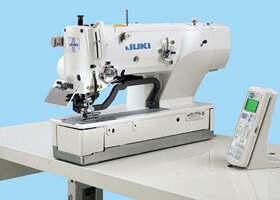 sewing speed - 3600 rpm . ♦ Max. buttonhole length 6,4-38,1 mm. 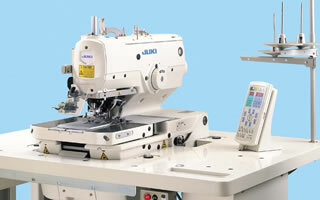 Computer-controlled, high-speed, lockstitch buttonholing machine. Cloth feeding and needle throwing system provided by stepping motor. APPLICABLE: All-purpose. 30 stitch patterns (standard ) for buttonholing. It is able to store 99 different patterns. ♦ Max. sewing speed - 4200 rpm. ♦ Max. buttonhole length 41 mm (optional: 70mm, 120mm). Computer-controlled, eyelet buttonholing machine with trimmer for needle and looper thread with gimp. Thread tensions can be separately established for various sections of a buttonhole Vertically driven cloth cutting knife controlled by a stepping motor. Separately driven right and left work clamps. Model: MEB-3200CS for cotton pants and working wear. APPLICABLE: For mens and ladies wear. ♦ Max. 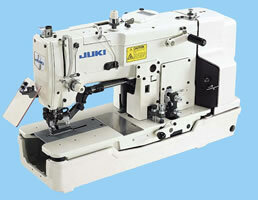 sewing speed - 2000 rpm. ♦ Max. buttonhole length 10-38 mm ( optional 50 mm).